Pentecost, Greek for “50th day,” was originally a Jewish term referring to the 50th day after Passover. For the first Christians, it was the 49th day after Easter, and, counting Easter, a period of 50 days. The apostle Paul twice used the word to reference the Jewish feast day, but the day has always been sacred to Christians. 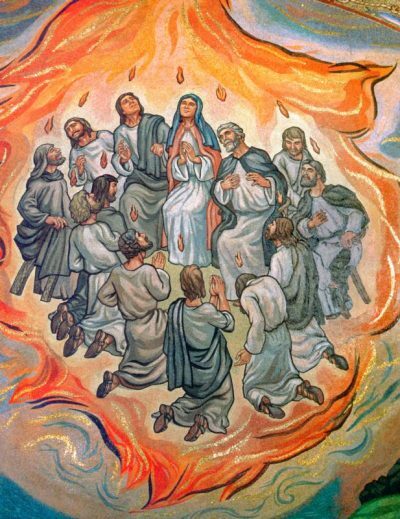 Pentecost was the decisive event in the early history of the church, an assurance to the apostles and other disciples that the risen Jesus was fulfilling his promise to send the Holy Spirit to them. This motivated them to overcome their fears of the Jewish and Roman authorities and to preach about Jesus and his redemptive mission that continues after his resurrection. While it cannot be determined how widely spread the feast initially became, Acts tells us that when Paul was evangelizing in Asia Minor, he “was hurrying to be in Jerusalem, if at all possible, for the day of Pentecost.” In his First Letter to the Corinthians (16:8), Paul speaks of staying for Pentecost in the Greek city of Ephesus, a gentile environment. Today Pentecost is a feast day in the Roman Catholic Church and some other churches. Coming so far after Easter, Pentecost reflects its late spring date. Flowers are used to decorate churches on this feast. The Catholic Church and others used to consider the eve of Pentecost to be a time of fasting, while Catholics also started a Pentecost novena. Pentecost was also a popular time for confirmation among those churches that have that sacrament or a ritualized observation as adolescents became adult believers. In the Middle Ages the dramatic scene of Pentecost was a very popular theme for religious art. Much medieval piety focused on Mary (for example, “Notre Dame” means “Our Lady” in French), and visual art for Pentecost often showed Mary seated while the Holy Spirit in the form of a dove flew above her and the male disciples stood or sat around her. Such works of art enjoyed great popularity in France and Italy. But the dramatic scene of Mary with her son’s closest disciples also appealed to music composers. Johann Sebastian Bach composed a number of cantatas for the German Lutheran observation of Pentecost. Wolfgang Amadeus Mozart, an Austrian Catholic, prepared a motet for Pentecost. And the list of artists who found inspiration in Pentecost is much longer than this. No feast coming after Easter will get much limelight, but Pentecost, in various forms, dates back to the earliest days of the church. As such, it has meaning for us, and it deserves our attention and reverence. The descent of the Holy Spirit on the disciples is indeed the origin, the “birthday,” of the church.